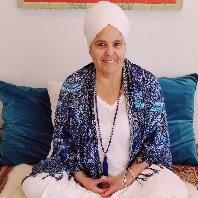 Guru Amrit Kaur Khalsa, KRI Certified L1 & L2 and a Professional Teacher Trainer has a Master degree and PhD with honors in Philosophy. She wrote three books, taught in different universities in Mexico City where she wrote political commentary and participated in civil organizations. In addition, she was a professional classical ballet dancer for 10 years and sang professionally in her youth. The main passion of her life has been Kundalini Yoga. She directed an Ashram for five years with her husband, SS Babaji Singh. She is a Reiki Master, certified in EMF and a 3rd level Sat Nam Rasayan healer. As a trainer she has the privilege to participate with a great team of teacher trainers in both Mexico and the US. She is part of the Board of directors of 3HO San Diego. The most important and honorable participation she has had in the Sikh Dharma world has been to help in the translation into Spanish of the Siri Guru Granth Sahib and its formal presentation and acceptance in the Takats of India, including the Golden Temple.